When I’m feeling stressed or a little blue, I don’t hit the vending machine or the drive-through window at the local fast-food joint. No, I grab a baking dish, or even a skillet, to make one of my favorite casseroles. Besides their comforting nature, casseroles are, by definition, incredibly easy—they’re simply any food that is cooked and served in the same dish. And for the record, they don’t have to be covered with gobs and gobs of melted cheese. Casseroles can retain their title as king of comfort food when filled with vegetables, even fish. And just a little cheese, or maybe none at all, can still make a great casserole. All it takes is a little ingenuity like substituting cottage cheese for regular full-fat cheese or bumping up the vegetables in your favorite casserole to make it healthy but still delicious. So grab a skillet, a baking dish or whatever oven-friendly pan you have and get cooking! Baked Mac & Cheese Mac & cheese can be a true comfort on a gloomy day, and our healthy update takes advantage of extra-sharp Cheddar, balanced with creamy low-fat cottage cheese, and tucks a layer of spinach into the middle, which may help picky eaters down their vegetables. Whole-wheat pasta adds robust flavor and extra fiber. Savory Bread Pudding with Spinach & Mushrooms Bread pudding, an economical dish designed to use up stale bread, is most often associated with dessert. 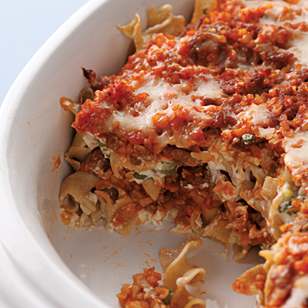 It's equally comforting turned savory, enriched with cheese and studded with vegetables. Chilaquiles Casserole Our version of this enchilada-style chilaquiles casserole is packed with nutritious beans and vegetables. Canned prepared enchilada sauce has great flavor and keeps the prep time quick. It can vary in heat level so find one that suits your taste. If you want to eliminate the heat altogether, try a green enchilada sauce (which is often milder than red) or substitute two 8-ounce cans of plain tomato sauce. Baked Cod Casserole Dry white wine and Gruyère cheese give this fish casserole a rich flavor that hides its virtue. Before baking, we top the dish with seasoned whole-wheat breadcrumbs, which add a wholesome, nutty flavor and dietary fiber. For variety, you can substitute almost any mild white fish.